California Highway Patrol officials investigate a fatal two-car collision on the westbound 105 Freeway near Central Avenue Thursday, April 28, 2016. 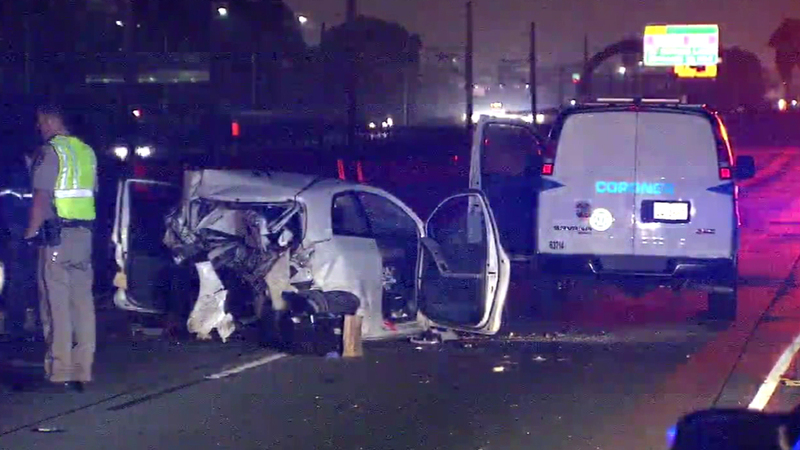 SOUTH LOS ANGELES (KABC) -- A man suspected of driving under the influence rammed into a disabled vehicle on the westbound 105 Freeway in Willowbrook early Thursday morning, killing a 25-year-old woman, authorities said. The two-car collision occurred near Central Avenue around 2:15 a.m., the California Highway Patrol said. A Toyota Yaris hit a retaining wall, crossed freeway lanes and became disabled in the carpool lane, and a Ford Fusion then hit the rear of the Toyota Yaris, CHP Sgt. Chad New said. The woman traveling in the Toyota Yaris was pronounced dead at the scene by responding firefighters. Her name has been withheld pending notification of next of kin. The male driver of the Ford Fusion was arrested on suspicion of DUI and transported to Memorial Hospital of Gardena in unknown condition. At least three lanes were initially blocked on the westbound 105 Freeway following the crash, but they were reopened at 6:10 a.m.